Everyone knows that there are nice beaches in the South Pacific. But if you go to any Pacific Island only for the sun and sand — you’re missing out! There are more cultures in Oceania than types of tropical flower, and each one is unique. 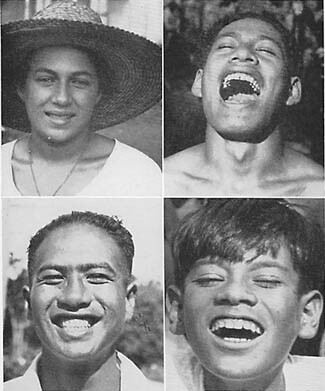 One of the best ways to understand Oceanic peoples is to look at language groups: Polynesian, Melanesian, and Micronesian. There are over 40 types of Polynesia languages, spoken on over 1000 islands across the central and southern South Pacific. You have probably heard of a few of the big ones: Tahitian, Samoan, Tongan, Māori and Hawaiian. A lot of Polynesian cultures have very strong political, economic and social structures. (Think of the great monarchs of Tonga and Hawaii!) Polynesian cultures were made powerful over thousands of years, through developing excellent canoeing and wayfaring skills. There are fewer Melanesian languages than Polynesian, mostly found north and northeast of Australia. Melanesian cultures are less marked by travel and empire-building than Polynesian cultures. A little more isolation meant that many Melanesian-speaking people developed highly complex artistic traditions. Think of the colourful headdresses of Papua New Guinea, the carvings of Vanuatu, and the painting of Fiji. Another interesting thing about Melanesian cultures is that many have developed trade languages that combine English, Australian slang and indigenous words. For example, Tok Pisin, Hiri Motu, Solomon Islands Pijin, Bislama, and Papuan Malay. Micronesian languages are spoken in the western most part of the South Pacific — the part of Oceania that many people don’t know much about, partly because it is quite small. Micronesian people are found on the Mariana Islands, Kiribati and Nauru, to name a few. The Federated States of Micronesia joins together four of these islands into a single nation. FSM has seven official languages: English, Pohnpeian, Woleaian, Yapese, Kosraean, and Chuukese. Even in these tiny, less populated areas, there are so many indigenous languages! Learning traditional languages is an important way to maintain a strong connection to community and history, but this doesn’t mean that languages keep people apart. Polynesia, Micronesia and Melanesia are not geographic regions, but cultural and language groups. This means that all over the South Pacific, Melanesians, Micronesians and Polynesians live peacefully side-by-side. For Pacific Islanders, our diversity is our strength!